Why do you run? The journey…and beer at the end. •	Ran a 5 Mile course spelling out “Marry Me Jes” to propose to my fiancé…she said yes. Favorite pre-race meal: Coffee, peanut butter on bread, and a banana. Favorite running quote: Running…For the most part, it’s cheaper than therapy! Best running advice given to me: Hydration starts the week leading into the race. Not the morning of a race! Dumbest running moment: After a packet pick up for a race, my wife and I didn't keep track of which bib was whose. We ended up running the race with the other person's bib. oops! Doh! Love you! During the fall/winter months, I play ice hockey at Centre Ice for a C League men's team. Finally, I love being creative. I'm lucky to have the opportunity to write a column about running for the Record Eagle, I help promote the Traverse City Track Club via social media campaigns and shoot/edit video for the Bayshore Marathon course video. How do you feel about representing the TCTC by being a TCTC Race Team Member? Blessed. TCTC club has been given me an amazing group of friends since I moved here in 2013. I’m exhilarated to represent a club and promote a sport that I’m so passionate about. 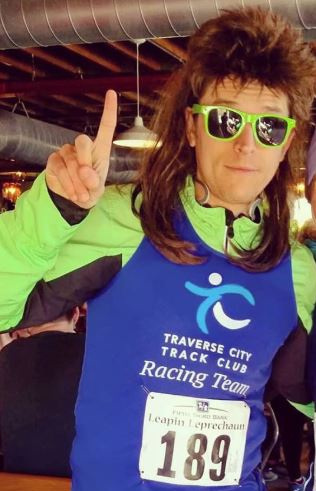 My mission when representing the Traverse City Track Club is to make the running club not seem like an elite running club but more just a family of crazy people who love each other and love running. Fast, slow or in the middle...you are my family with the Traverse City Track Club.